Opened in 1977, Golf Santa Ponsa I covers a distance of 6543 meters, 18 holes (Par 72), the 10th hole is one of the longest in Europe. Designed by Folco Nardi (involving Pepe Gancedo), the Golf Santa Ponsa I covers an area of ​​73 hectares which makes it a long course with lakes and a variety of trees (olive, pine, almond, etc.) to suit all types of players thanks to its wide fairways and tees Starts where most big hitters will benefit, but do not forget to have the short game tuned in order to finish with the best results. Opened in 1991, Golf Santa Ponsa II has a distance of 6053 meters, 18 holes (Par 72). pits Golf Santa Ponsa II are located within a pine forest or between large lakes, thereby offering many game options. The 18th hole is an interesting par 3 as the green is located on a portion of land in the form of the island of Mallorca. This field also has facilities for learning golf, a driving range of 350 meters . longitude with tees on both sides of more than 100 meters, putting green and short game area is a field exclusively for shareholders. 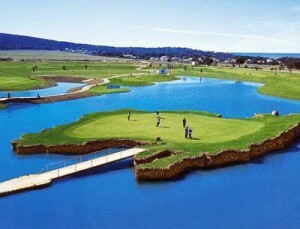 Opened in 1999, Golf Santa Ponsa III has a length of 1.599 m. for men and 1.332 m. for ladies, 9 holes (Par 30). As with Golf Santa Ponsa II it is for exclusive use of shareholders and both share the Club House, driving range, 350 m. in length with tees at both ends of more than 100 meters, putting green and chipping area. It is an ideal course for beginners and for players who wish to improve their short game. It is also a course which adapts to Pitch and Putt.